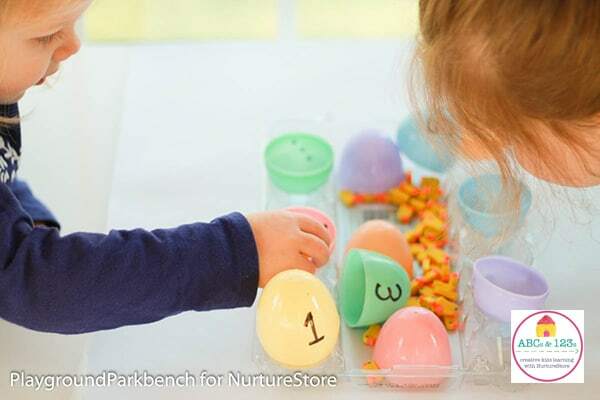 Meghan from Playground Parkbench joins our ABCs and 123s letter and math series today with this clever idea for counting with plastic Easter eggs. Incorporating seasonal themes into learning activities always ups the interest level for kids. Today’s activity does just that – teaching one-to-one correspondence, using simple and super affordable materials, while also challenging little hands’ fine motor skills at the same time. One-to-one correspondence is a basic math skill for preschoolers. Once mastered, it enables them to actually count objects and identify that 4 objects equals 4. While young toddlers are often capable of memorizing and reciting ‘1, 2, 3, 4…’, actually mastering one-to-one correspondence takes practice. Affordable, seasonal math manipulatives are a great way to practice this basic math building block and keep it entertaining all year round! 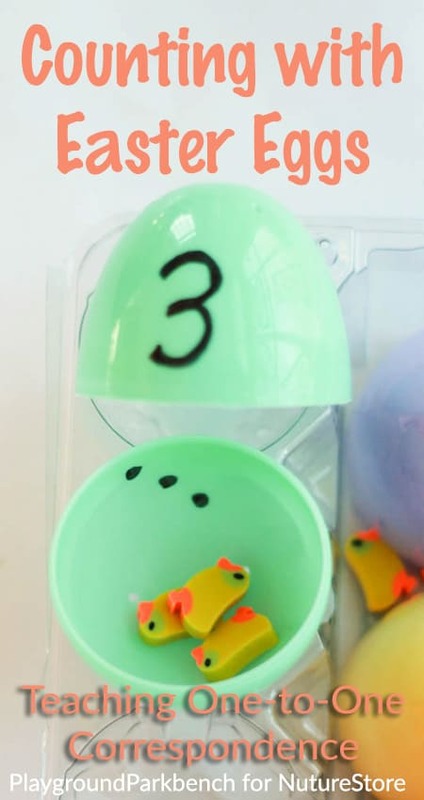 For this Easter-themed math activity, you will only need a few basic supplies, costing in total less than $5! Use your black Sharpie to put dots on the inside, bottom half of your Easter eggs. Write the corresponding number on the outside, top half of the egg. I made dot formations like those seen on the face of a die. Recognition of numbers in this formation is also an important skill for preschoolers to master without having to actually count the individual dots. Our miniature holiday-themed erasers were baby chicks that I found in the Target Dollar Spot, but I’ve seen similar at most Dollar Stores and craft stores as well. 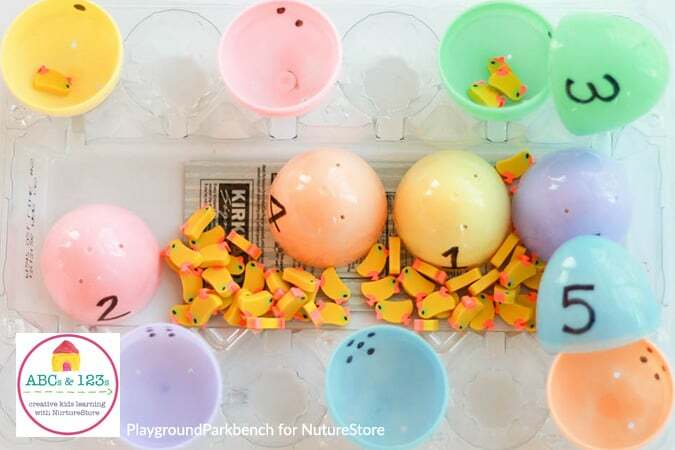 Using the egg carton to hold all the eggs and erasers, instruct your child to add the correct number of erasers to each egg. Then, match the written numeral to the correct number. The small pieces and closing the eggs while keeping all the chicks inside make for a great fine motor skill challenge too! You can also then use them as shakers. For my 2 year old, using half a dozen eggs and counting up to 6 was sufficient challenge. My 4 year old was capable of more. To add to the challenge for older preschoolers, you can use numbers up to 12 with the full dozen eggs. 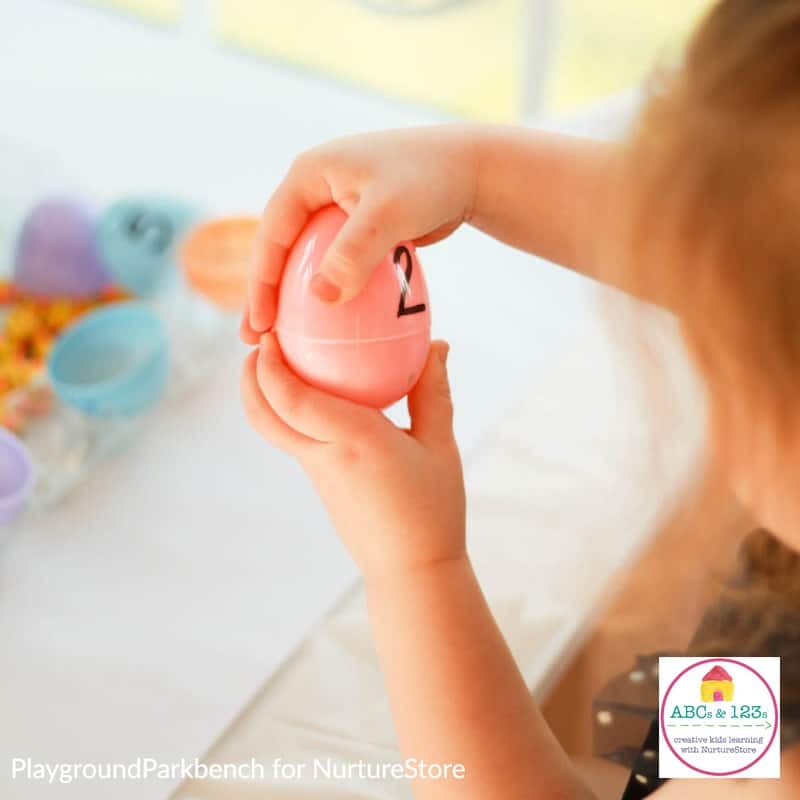 For older, elementary children, you can turn it into a simple addition challenge, combining egg contents to reach addition solutions. For more fun math activities for kids, be sure to check out Teaching Place Value to Preschoolers with Pasta and Deck the Crown with Jewels – A Sorting & Dice Game for Preschool. Meghan is a former hedge fund professional turned SAHM to Big M (4), Lil’ M (2), and Baby M (5 months). She writes at Playground Parkbench, where she shares kids activities and parenting tips. Check out her first book: Green, Crafty & Creative, 70 eco- and family-friendly crafts, activities and tips and the perfect resource for Earth Day!